Welcome to our Monthly Challenge Blog Hop! I've joined a group of creative bloggers to bring you a monthly challenge blog hop on the 2nd Monday of each month. 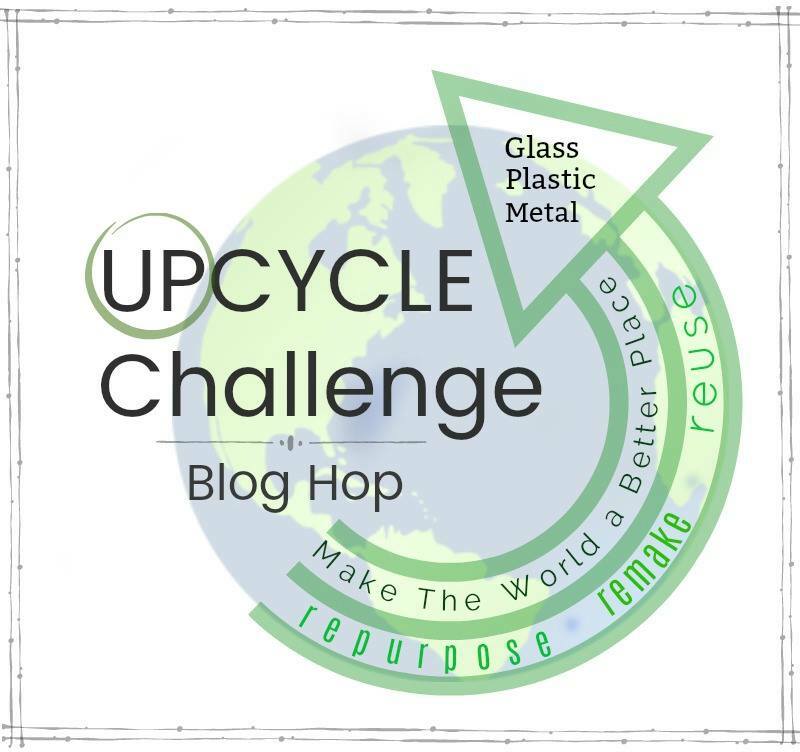 For January, the challenge is to upcycle glass, plastic or metal. We can all relate to upcycling or repurposing anyone of these materials from time to time! So let's get started! For this challenge I've chosen to enhance a galvanize metal sign into a decorative wall plaque by first painting the galvanized metal with the colors in a napkin I found online and then decoupaging the napkin on top of the checkered pattern design. I thought this to be a pretty cool idea for me to do! Imagine my delight when I found napkins online with a deer silhouette design in some of my favorite colors! Just perfect for a winter-time theme! And what a theme! Checkered patterns are very popular now and work with just about every design style. So whether your space is traditional, rustic, shabby chic, coastal or modern, this versatile pattern can be a welcome addition to your home decor in any season! Take a look at the galvanized plaque and napkin that I'm using! The colors in the napkin are quite lovely! A deep pink and shades of plum/berries! Who would have thought to color a deer with these! Duck Clean Release painter's tape - .94"
Let me first say that in hindsight, I should have used a primer first ( I knew this), but I was eager to get started and thought using a multi-surface acrylic craft paint would be ok since the label said for metal, too. So, unfortunately, there was some small lifting of the paint. Plus, every time I added the painter's tape I was quite worried that the paint would come up in even larger chunks. Oh well, thankfully that didn't happen! Anyway, to be safe, cover the entire sign with a good metal primer paint first and let dry completely and then use the paint colors of your choice (deep pink) to cover again . . .
adding a second coat and let dry. Then, find the center of the sign (I eyeballed it using the v shape protrusions as a guide) and lay down a narrow strip of painter's tape across the entire width (this will be the spacer strip). Then add two more strips to the right and left of the first tape, smoothing down and out the side edges. You don't want paint getting under the edges. Remove the spacer strip and add it next to the strip that's there. Make sure you are lining up all the strips as straight and accurate as possible next to each other, smoothing the edges down as you go. Then continue to add new strips of painter's tape. And keep re-using the spacer strip for the entire sign, left and right, so the lines and spacing will be straight. Continue as before until you reach the end of the sign. Once all the tape is in place and smoothed down, begin painting over the exposed areas with a spouncer sponge brush. I'm using the color Mulberry for this. Paint all the open spaces not covered by the tape. Once all the open areas are painted, remove all the tape strips and let the paint dry completely! In the pic below, the painted lines looked nice but the edges could have been sharper. It was probably because of the painter's tape that I used. I noticed that it didn't have a good gripe. So I bought Frog tape to try instead and found that its' gripe was too good and lifted the paint even more! So I stuck with the blue tape. Once dry, add painter's tape strips in the opposite direction, following the same steps as before, completely covering the sign. Next, paint the open areas with the same color as before. I made the mistake of removing the painter's tape once I had painted all the exposed spaces. Instead, the tape should have remained on and left to dry before moving on to the next step. So I had to re-tape over the areas to paint on the next color. This time I used cosmetic sponges that I got at the dollar store to paint the spaces. This type of sponge seemed much easier to use and didn't leave bubbles like the spoucher sponge brush. Once all the open spaces were painted, I removed all of the painter's tapes to reveal this lovely pattern. Since the napkin has broken strips in the pattern, I thought I would add a couple of narrow strips along the top and sides . . .
using the sames steps as before but lightly brushing on the paint in small lines! To decoupage the napkin on to the plaque, paint mod podge along the center following the size and shape of the napkin. Lay the napkin down, face up and smooth out. *I did not remove the white layers of the napkin because I didn't want the stripe pattern of the plaque to show through as much. Once dry, I added two more pieces of napkins over the first one to define the image and dabbed on a bit of white paint and water to the background. And finally, I painted on additional mod podge over the entire plaque to seal once it was completely dry. Sorry about the lighting. It's showing like a cranberry, but it really is more of a plum, as shown above. This plaque was oh so fun to create! It's such a simple and easy way to bring color and a trendy pattern to any decor! Be sure to check out how the others met this month’s challenge by clicking the links above! Love your choice of colors and your tutorial is so detailed! All the pictures are super helpful. I like that this project can be tailored to suit anyone's styles and tastes! This is a fun way to change up the look of the plain metal plaque. The colors are wonderful. I've found that after painting if I go ahead and add some protective spray finish and let that dry, the painters tape will adhere better and not pull off the paint. That's a great idea, Beverly! I wish I had thought of that! It would have saved me from worrying each time I took the tape off! This is so beautiful Gail! I could not imagine that is a metal underneath. When I saw this on Facebook I thought it is made by cardboard!!! Excellent work!!! I tried painting a similar pattern on glass jars last year which worked well but I never thought to try painting on metal like this. This looks fabulous and goes SO well with that lovely napkin. Your checkered painting always looks good! I love all your shades of purple! Great find. Thanks for the great instructions on painting a plaid pattern! 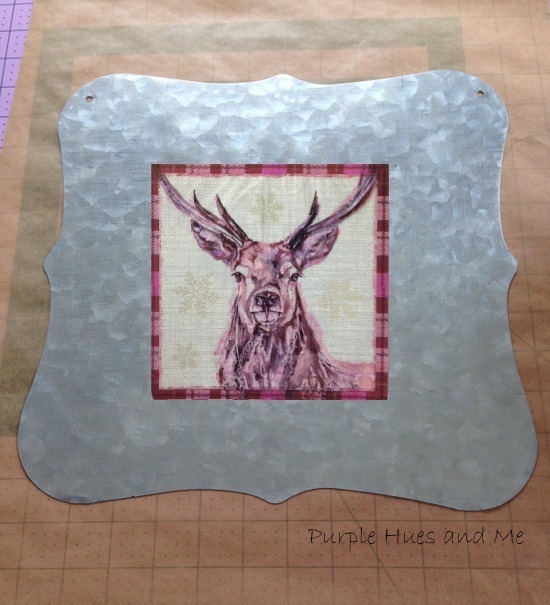 Who would have thought you could find a handsome purple-ish deer design? Love it! Very nice project! I love how it came out! I'm loving the plaid pattern and the colors! Great way to dress up an old metal sign and turn it into something fabulous! Pinning! I have one of those metal signs! I love your transformation. Pinning!